​In the spring of 1781, Henry Bedinger’s health was much improved from the debilitating conditions of his imprisonment by the British. He had been officially exchanged by the British in November 1780. Being released from the conditions of parole, Henry was no longer prohibited from engaging in military operations. George Michael, after carrying wagon loads of supplies to General Green in the Santee Hills of North Carolina, returned to Kentucky in late winter of 1780 or early 1781. He was at Strode's Station to defend the Station when Indians attacked the station on 1 March 1781. He returned to Virginia and in May 1781 both Henry and George Michael Bedinger raised men to serve in companies commanded by Col. William Darke. Col. Darke’s companies were to reinforce the Continental units in Virginia. All three Bedinger brothers were now in the Virginia campaign and were there through the Yorktown Siege. As related above, George Michael Bedinger had recruited a company for the regiment of Col. Darke in Berkeley County. In his deposition Bedinger says that in the month of May 1781, he took command of the Militia company under Col. William Darke and was engaged in military operations in Virginia where Gen. Cornwallis' troops were active in skirmishing and attacking strategic sources of the patriots. Bedinger's company was active through the period leading up to and at the the siege of Yorktown. On the fourteenth day of September, 1781 the American Commander–in-chief, George Washington, reached the headquarters of General Lafayette in Williamsburg. [viii] Henry Bedinger in his journal records that Lt. Daniel Bedinger and two other officers and twelve privates came down with ague [chills] and fever at the headquarters camp in Williamsburg. In a letter written in 1834, George Michael describes his companies’ approach to Yorktown, before the siege, when the British were established there in force. “… You are under a mistake in relation to my being present on the 12th of October when Cornwallis was captured. I am confident very few officers or men in our army rendered more essential services than I think I did at or before the siege of York, and when I think of it I hope I shall ever, while I have life and reason, most humbly, devoutly, and heartily thank and adore the supreme Author of all Goodness and Mercy, who then and so often since has saved me from impending dangers. “And altho’ it is with reluctance I am induced to speak or write even to a brother of my own services, I cannot here, in justice to myself and those who were with me, omit stating to you, as well as I can now recollect after the lapse of 53 years, that I was present at the siege of York, & was with the first party that dared in hope to go near our enemies in Yorktown: viz., Cornwallis’s Army. “A short time before Yorktown was besieged, and when our army lay near Williamsburg, Colonel Darke marched a detachment of, I think, less than one thousand, mostly militia , who were then or afterwards called The Forlorn Hope, as it was then generally thought that on our arrival at the suburbs of the town the British troops, horse and foot, would immediately Sally out upon us and cut us off as we had no other troops to help or aid us near. “When we got in sight of he enemy and were expecting an Immediate attack, from their cavalry, I acting as Adjutant, or could say Major, and as the men had marched in platoons and open columns, marched them up into close solid columns, faced outwards, front rank kneeling, but arms firm; fixed bayonets, leaning out at an angle of near forty-five degrees. This maneuver having been performed briskly and promptly, it is believed that the enemy thought us well disciplined if not regular troops, & that we were only an advance party, & that the U. S. Army were close at hand. “They did not attack us, except at a distance so great that they could not do us much injury, but suffered us to go back without much firing ... I never yet have been able to account for such a motion. I think it was the Colonel’s usual fire and rashness, & that General Washington perhaps had a desire to know what the enemy would do on such an occasion and acceded to it. It was , in my opinion, an extraordinary, and I think an unnecessary temerity. We had much to lose, and I have never been able to see what great advantage could have been expected of it. In early October Henry Bedinger was laying off ground for huts for winter quarters when his brother George Michael arrived on his return from Yorktown. Henry described Michael as being “somewhat indisposed”. On his way, Michael had stopped at Gen. Washington’s headquarters in Williamsburg. A few days later, before on 14 October 1781, Michael, carrying letters from Henry to his mother and Capt. Shepherd, Michael set out for Shepherdstown by way of Richmond, where he was to settle the accounts of his Company. The surrender of British troops under Gen. Cornwallis at Yorktown signaled the ultimate victory of the Continental Army over the British. However, the armed conflict between the Colonies and Britain would continue. The British were still ensconced in Charleston, South Carolina and Savannah, Georgia. The British were on the frontier of Virginia (now Kentucky) and with Loyalists and Indian allies were engaged in armed attacks and sieges of American settlements on the frontier. Henry writes in his journal, dated November 15, 1781, of his safe arrival in "Shepherd's Town, where I arrived that Evenng to Give Joy to my Friends & Sattisfaction to my Self after a Journey of 193 Miles from Cumberland Old Ct. House, where I left my Brother Daniel and Many Friends." Daniel was at the siege of Yorktown and witnessed the surrender of the British [xi]. Daniel Bedinger was commissioned May 7, 1782 Lieutenant in the 4th Regiment Virginia Line [xii] and was assigned to Lieut. Colonel Thomas Posey’s detachment of the 7th Virginia Regiment whose regiment under General Anthony Wayne was marched south to bolster Gen. Greene’s forces. By 1782, Gen. Greene had regained the entire southland except for British strongholds at Savannah and Charleston. 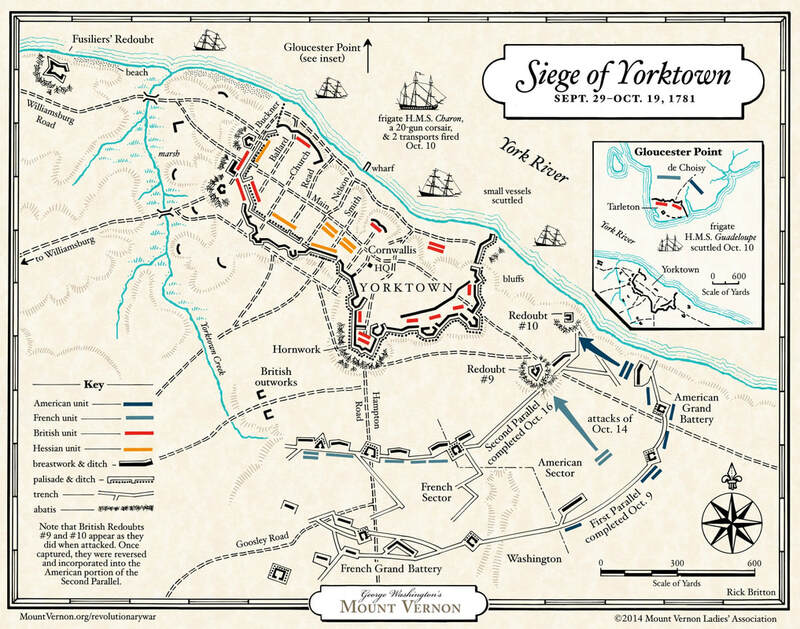 Although the main British army under Lord Cornwallis had surrendered at Yorktown in October 1781, virtually ending the war in the east, fighting on the western frontier continued. Aided by the British garrison at Fort Detroit, Indians north of the Ohio River redoubled their efforts to drive the American settlers out of western Virginia (now Kentucky and West Virginia). In August 1782, with British support, about 50 Loyalists, and 300 Indians, crossed the Ohio River into Kentucky. They meant to surprise and destroy the settlement of Bryan Station, but their movement was discovered and the settlers took shelter within their stockade. The British led force laid siege to Bryan Station on August 15, 1782, killing all of the settlers' livestock and destroying their crops, but withdrew after two days when they learned that two contingents of militia were on their way to aid the settlers at Bryan station. A Virginia militia led by Colonel Benjamin Logan, which included Captain George Michael Bedinger, and a force of Kentucky militia led by Col. John Todd assisted by Lieutenant Colonel Daniel Boone. The Kentucky militia of about 180 men arrived at Bryan Station on August 18. Colonel Benjamin Logan leading the Virginia militia, was gathering men and had not yet arrived. The Kentucky militiamen could pursue the raiders immediately, to keep them from escaping, or they could wait for Logan to arrive with reinforcements. Daniel Boone advised waiting for the Virginia militia, that was only a day away, but others urged immediate action, pointing out that the enemy force had a 40-mile lead on them. Boone felt compelled to go along. The Kentuckians set out on horseback over an old buffalo trail before making camp at sunset. Colonel Logan and the Virginia militia arrived at Lower Blue Licks the day after the battle. Captain George Michael Bedinger has oft been reported as taking part in the Battle of Blue Licks, however, Bedinger with Colonel Logan and the Virginia militia arrived at Lower Blue licks the day after the battle and had the grim task of retrieving the bodies of his comrades. The British and Americans signed preliminary Articles of Peace November 30, 1782 and the Treaty of Paris September 3, 1783. Daniel Bedinger was selected to membership in the Society of the Cincinnati; his certification bears the signature of George Washington and the date of Mount Vernon, March 1, 1787. Henry Bedinger received the same honor bestowed by George Washington upon selected officers of the Revolution. The Society was composed of officers selected by Gen. Washington who served for the duration of the war. George Michael Bedinger had enlisted for several terms of limited duration because he felt the need to be in Shepherdstown at times to provide aid for his mother and siblings and to be there to aid his brother Daniel when he was recovering from British imprisonment; he made trips to New York where Henry was held prisoner of the British to bring money for his care. ​[i] Dandridge, Danske, 1910, Historic Shepherdstown, The Michie Company, Printers, Charlottesville, Virginia, 389 p., pp. 216-217. [ii] Levin, Alexandra Lee, 1995, For A Brave America the Bedinger Brothers in War and Peace, 1775-1843, Shamrock Hollow, John Day, Oregon, 215 p., p. 53.
iv] Clary, David A., 2007, Adopted Son: Washington, Lafayette, and the Friendship that Saved the Revolution, Bantam Books, New York, 306 p.
​[v] Dandridge, Danske, 1909, George Michael Bedinger, A Kentucky Pioneer: The Michie Company, Printers, Charlottesville, Virginia, 232 p., p. 83. [vi] Dandridge, Danske, 1909, George Michael Bedinger, A Kentucky Pioneer: The Michie Company, Printers, Charlottesville, Virginia, 232 p., pp. 83-84. [vii] Bedinger, Henry, Letter to Cap. Abram Shepherd, September 9, 1781, in Magazine of the Jefferson County Historical Society, vol. 1, 1935, p. 49. Promontory Press, New York, 712 p.
[ix] Dandridge, Danske, 1909, George Michael Bedinger, A Kentucky Pioneer: The Michie Company, Printers, Charlottesville, Virginia, 232 p., pp. 79-82. [x] Dandridge, Danske, 1909, George Michael Bedinger, A Kentucky Pioneer: The Michie Company, Printers, Charlottesville, Virginia, 232 p., p. 84. and Levin, Alexandra Lee, 1995, For A Brave America the Bedinger Brothers in War and Peace, 1775-1843, Shamrock Hollow, John Day, Oregon, 215 p., p. 53. [xi] Danske Dandridge, unpublished manuscript, in Bedinger and Dandridge Family Papers, David M. Rubenstein Rare Book & Manuscript Library, Duke University, Durham, North Carolina. [xiii] Henry Bedinger's Statement of Daniel Bedinger's service given January 31, 1839,by Capt. Henry Bedinger, 5th Regiment Revolutionary Army in Southern Campaigns American Revolution Pension Statements and Rosters. [xiv] "Daniel Boone and the defeat at Blue Licks", published by the Boone Society, Minneapolis, 2005, by Neal Hammon. http://genealogytrails.com/main/military/battleofbluelick.html. George Michael Bedinger is listed among the participants in the battle in this publication. However, in searching the references given in this publication, I have found no documentation to substantiate his presence at the Battle of Blue Licks. [xv] George Michael Bedinger is reported by Collins in his History of Kentucky (full reference given below) to have fought in the battle, however no primary documentation of his presence at the battle is known to this writer. The definitive statement accepted by this writer is given in the biography "The Late Hon. George Michael Bedinger" written by George William Ranson in 1881 for the Carlyle, Kentucky Mercury it which it is stated, "In 1782 occurred the slaughter of the ill-fated force at Lower Blue Licks. Bedinger was not at that point at the time. He was with Ben. Logan's Command which arrived at that place a day or two after the battle and discharged the melancholy duty of burying their fallen friends and comrades." [xvi] Collins, Lewis, 1847, History of Kentucky, Published by Lewis Collins, Maysville, KY; and J. A. & U. P. James, Cincinnati, 560 p., p 485. ​[xvia] Everett Wade Bedinger, An Autobiography, undated, manuscript, 136 p.
[xvii] Dandridge, Danske, 1909, George Michael Bedinger, A Kentucky Pioneer: The Michie Company, Printers, Charlottesville, Virginia, 232 p., p. 85. Page Revised 10 June 2015, 2 September, 2015, and 10 October, 2015. Page Revised 3 August, 2017, and 9 October, 2017.